We have an air alert due to smoke and ash from fires burning in Southern California. 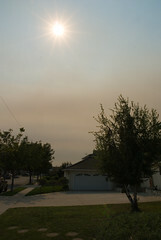 I’m working from home today and I stepped outside at lunch to find dirty cars, ash on the street and a yellow sun. There normally would be a large hill (Palos Verdes peninsula) easily visible over my neighbor’s house in this photo.